Multi-class World Vet champion Pete Murray was the foreman of Project Grandpa. There was little agreement regarding the 2018 Yamaha YZ450F. Some test riders saw it as the most advanced dirt bike that Japan had ever produced. Others felt it had the same old shortcomings; it was a big, clumsy brute of a bike. Pete “Grandpa” Murray was one of the leading proponents of the new YZ. He loved the power. He loved the suspension. He loved the engineering behind it all. 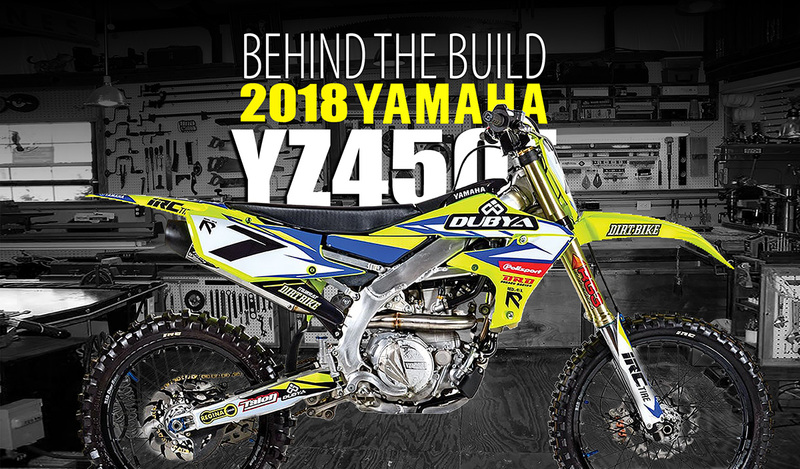 Pete conceded that the YZ wasn’t perfect, so he took on the challenge of “Project Grandpa.” Over the course of months, he made a number of changes and presented the bike to the rest of the staff as his take on a Super YZ. Here’s what he did. 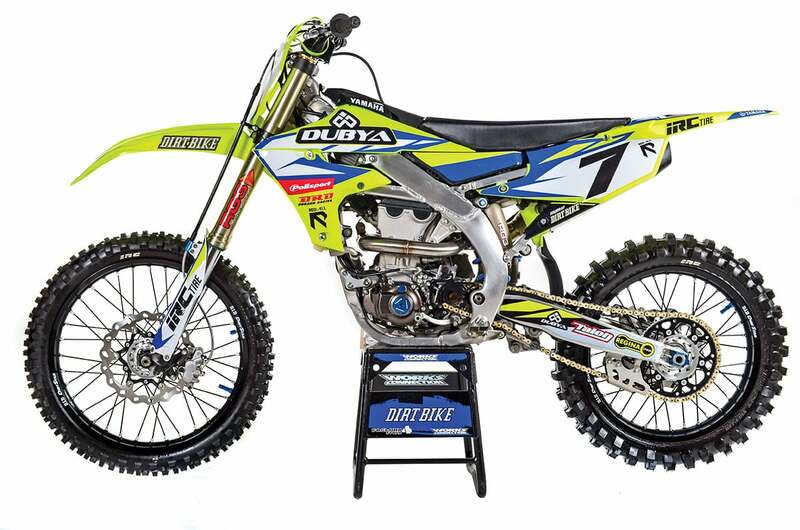 The Polisport body kit and Decal Works graphics gave the YZ a new look. One of the most innovative aspects of the 2018 YZ450F is the EFI/ignition system. It can be personalized through the use of a smartphone app. 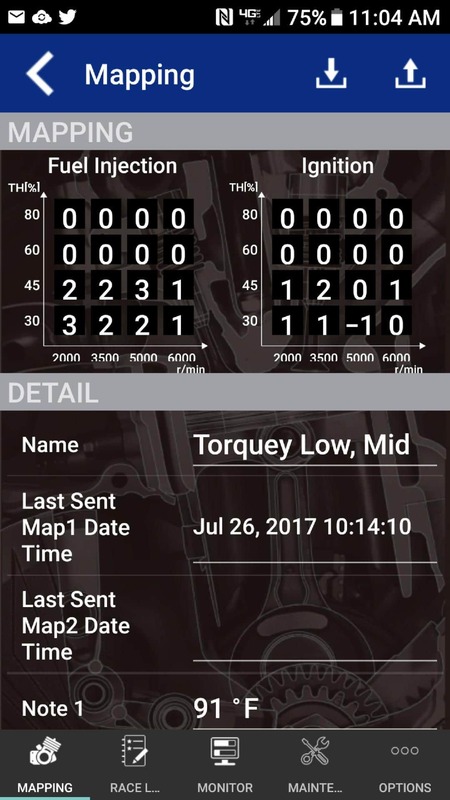 The Yamaha Power Tuner can be downloaded to any iPhone or Android, and with it you can adjust fuel mixture and spark advance according to throttle position and rpm. 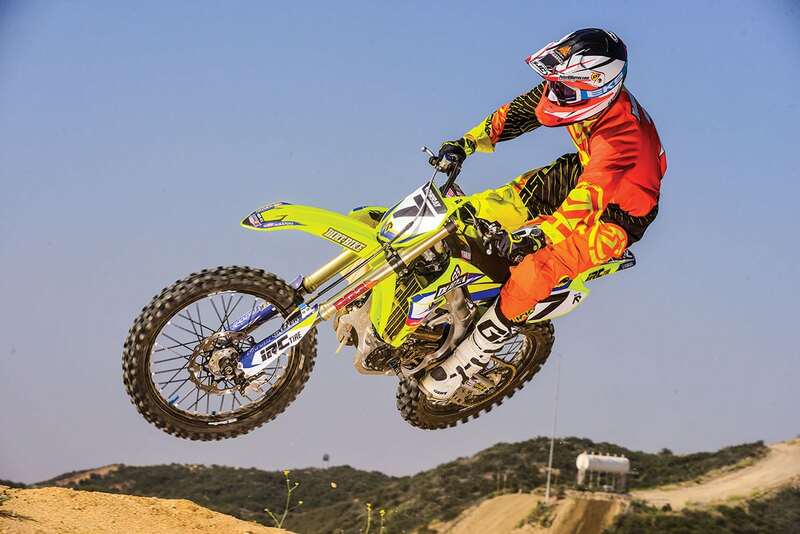 One of the very first maps that we tested was brewed up by Travis Preston, a former 125 West Supercross champion and now a full-time employee in the Yamaha testing department. The Travis map seemed to be the opposite of what you would want out of a 60-horsepower, 450cc mauler. It made the power ramp up more quickly and actually hit a little harder. That didn’t sound at all like what we wanted; the bike was already such a beast. But, as it turns out, power characteristics are a huge component of how a bike handles and also affect the rider’s perception of weight. With the livelier feel, the YZ actually felt like it lost weight. It was still a beast of a bike, and it still would accelerate like a 60mm artillery shell, but it changed the feel of the bike in a good way. Don’t make us explain why or how. Then, Pete went further down the same road with Wade Wilcox at Injectioneering. Wade is a mad scientist who worked at American Honda in the formative days of electronic fuel injection on bikes like the CX650 Turbo. With subtle, almost invisible modifications, he can make a throttle body do tricks. He took the YZ’s Mikuni throttle body, taper-bored it and reconfigured the throttle butterfly. The result was a freakish change. Again, the bike became more lively and responsive. It also gained about 2 horsepower throughout the range. Another piece of the motor puzzle was a Dr. D exhaust. We know that the stock Yamaha pipe is extremely hard to beat, but Doug Dubach (owner of Dr. D) probably has more testing time than anyone. The pipe saves a couple of pounds of weight as well. The only other change to the Yamaha’s motor was a Rekluse Torqdrive clutch pack. 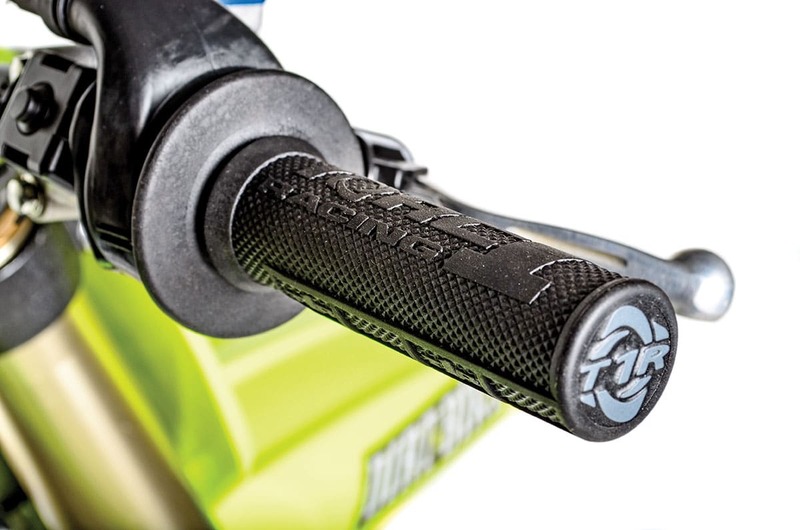 This increased the number of plates for more grip with less pull. The Yamaha has a very good clutch by the standards of Japanese bikes, but the hydraulic clutches that now come on Euro bikes have pushed our expectations for feel, actuation and reliability higher. The Rekluse allows the Yamaha to reclaim some of that ground. It’s really difficult to outperform the stock YZ exhaust. Dr. D did a good job and saved a little weight along the way. Even though it wasn’t Pete’s intention to get more horsepower out of the YZ, that’s what happened. The real goal all along was to make the YZ more manageable and easier to turn. Going into this, Pete was already on the side of the civil war that favored the YZ’s handling. He knew exactly what the anti-Yamaha guys were saying, but he considered the bike’s strengths well worth the price. 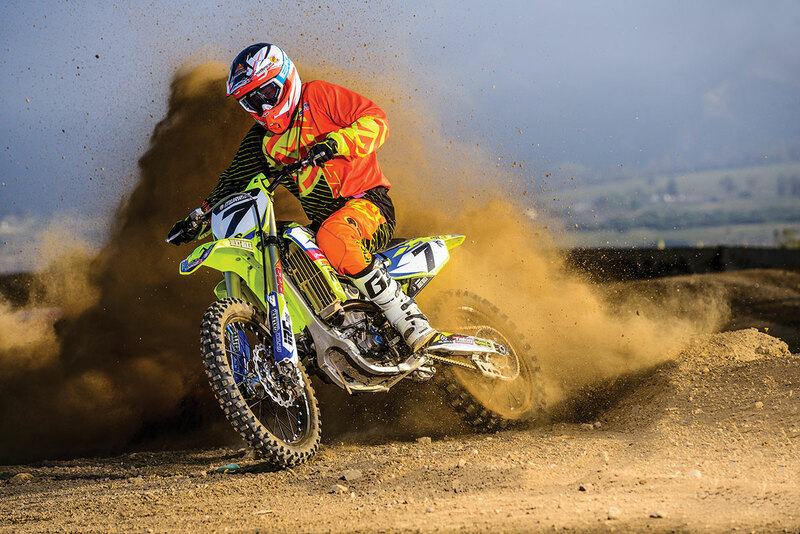 The knee-jerk solution that riders invariably suggest is a weight-loss program, simply because the Yamaha is 14 pounds heavier than the KTM 450SX. Unfortunately, we’ve been down that road before. 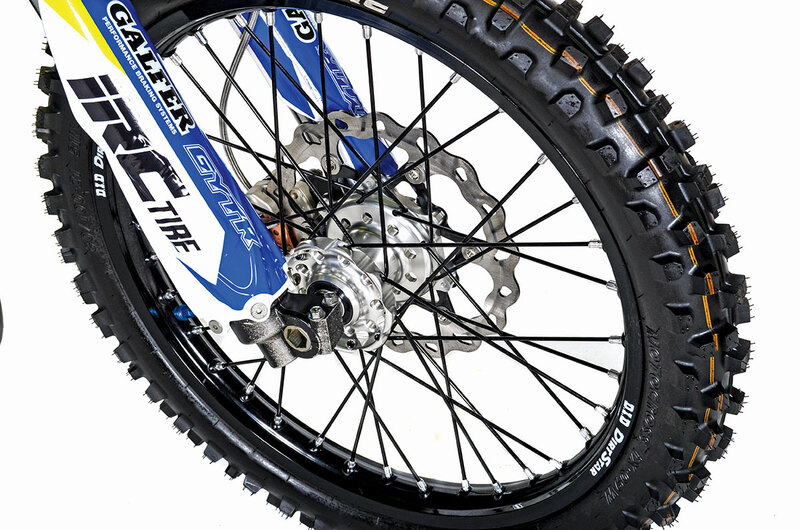 Taking 14 pounds off a bike is hard to do and very expensive. It’s easier to take 14 pounds out of a rider’s belly, but that’s another story. Plus, as we discovered with the changes in the power delivery, the perception of weight isn’t always about what the scale says. If the bike felt lighter, we would be happy regardless of the number. The first task was to improve the YZ’s goofy ergos. For some reason, the 2018 model came with a lower seat and taller bars than the 2017 version. Both those changes make the rider place his weight too far to the rear, and that makes cornering more difficult. Ride Engineering makes bar mounts that bring the handlebar location down 5mm and Yamaha’s own accessory department has a taller seat. 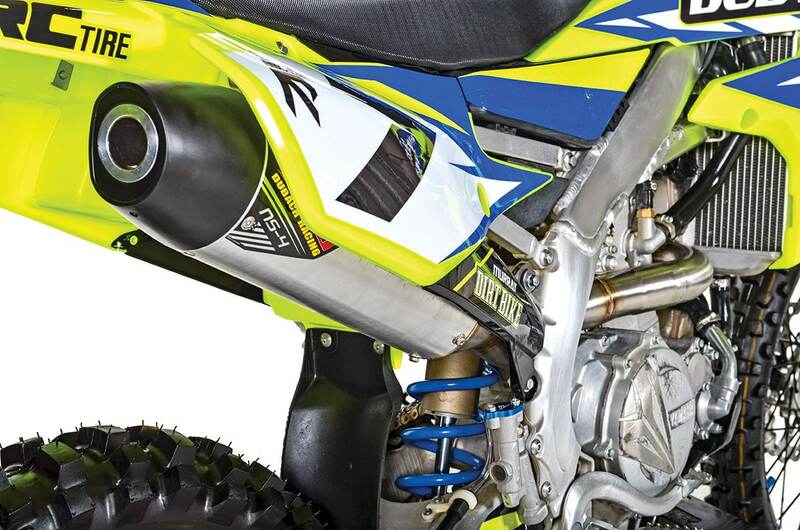 Dr. D’s motor relocation kit moves the YZ’s engine forward 1.5mm. Believe it or not, that makes a noticeable difference in handling. The next step was a little offbeat. 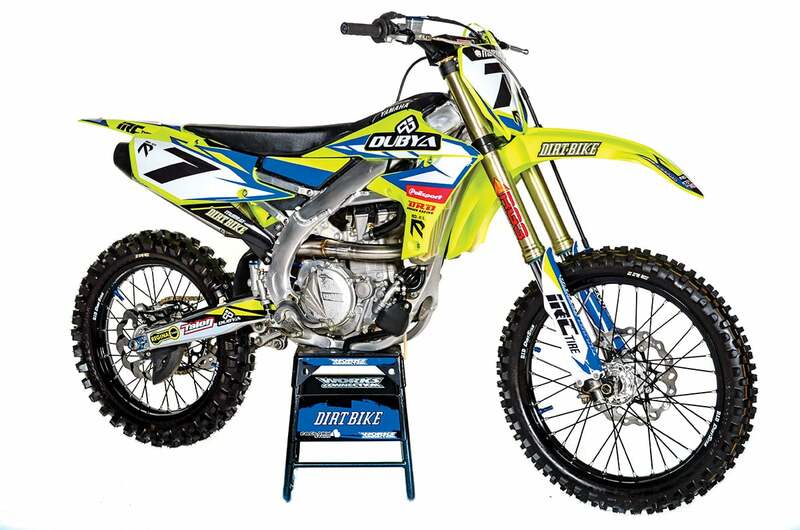 Dr. D has an engine relocation kit that allows you to move the YZ’s motor forward by 1.5mm. The main component is a rear bushing with an offset hole where the swingarm bolt passes through the engine cases. It moves the motor forward, and there’s enough slop in the other engine mounts to absorb it. Is 1.5mm enough to make a difference? Oddly enough, yes. We wouldn’t have believed it if we didn’t ride it for ourselves. It changes the attitude of the bike slightly and works together with other slight adjustments. When the bike was delivered, the fork was flush with the top of the triple clamp. In initial testing, we slid the fork tubes upward by 5mm, lowering the front end with good results. After the engine relocation, the new bar mounts and the taller seat, that 5mm seemed like too much and the bike had a stinkbug attitude. We changed it to 2mm, and it was the best combination yet. Dubya laced up Talon hubs to a set of D.I.D Dirt Star rims for a little grandpa bling. RG-3 then reworked the suspension, making only very subtle valving changes. The suspension was the one aspect of the 2018 YZ that was universally praised, so we didn’t give them the green light to go crazy, just to dial the bike in for Grandpa’s weight and style. The final pieces of the puzzle weren’t necessary but finished the job with style. Dubya laced up some wheels with Talon hubs and DID Dirt Star rims. Decal Works did the graphics, and we used Polisport’s outlandish fluorescent bodywork to finish the look. 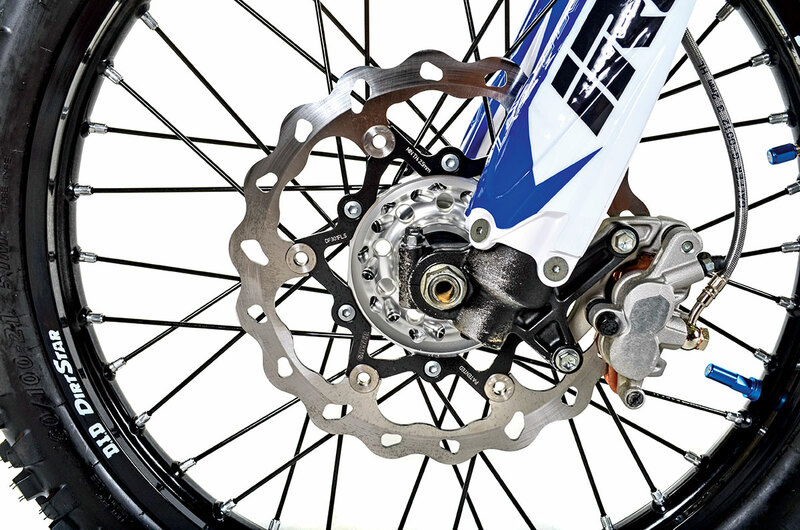 The most common YZ450 complaint focuses on its feeling of mass and clumsiness. As it turns out, the power delivery is a significant component in this perception. All of the riders who originally complained about the Yamaha’s manners have come on board the Grandpa train. They all feel it’s more agile and easier to handle. The weird twist was that most of the work was accomplished by changing the way the motor feels, not through weight loss or any geometry changes. This isn’t what anyone expected. The motor relocation kit was another revelation. It didn’t really make the bike feel lighter, but it did make it more sure-footed in turns. We’re stunned that such a small change could even be noticeable. 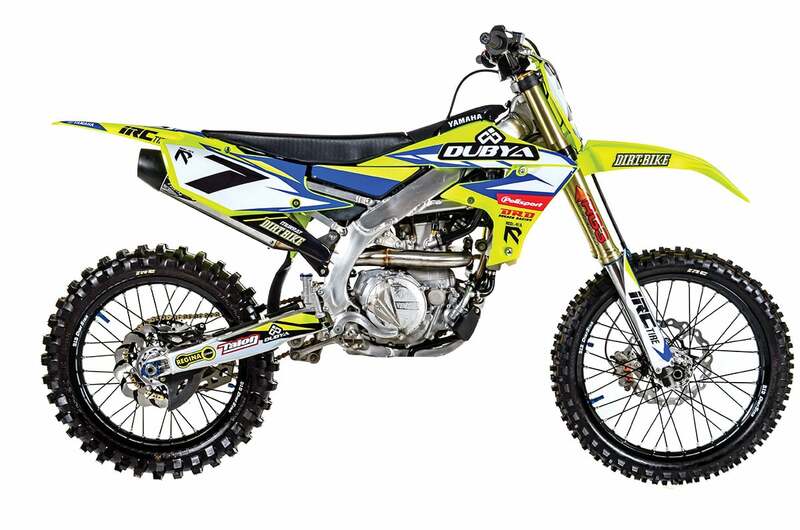 Doug Dubach is one of the most savvy test riders we know, and he’s been selling the kit for earlier YZ450s with similar results. The success of Project Grandpa wasn’t an accident. It was the result of careful testing and focused attention. As it turns out, there’s no substitute for earning results the old-fashioned way.